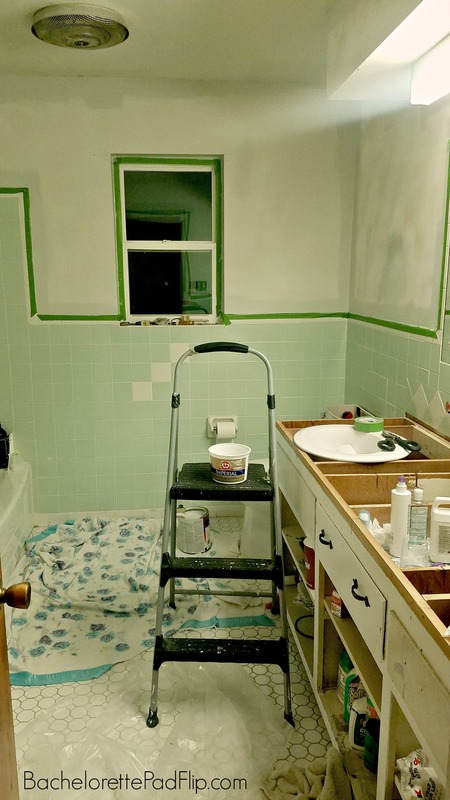 I’ve been complaining & contemplating on Facebook and Instagram about picking a gray paint for the Green Bathroom. Licking wet cement would’ve been more enjoyable than sorting through all those gray paint swatches. I bought so many samples, painted little sections, and then immediately nixed them. You think gray is gray…but, as the movie implies, there’s several shades of gray! The walls were white in parts and had wallpaper on other parts. As I started this process of picking paint and texturing walls, I discovered that apparently there was some floral retro wallpaper in here at some point. 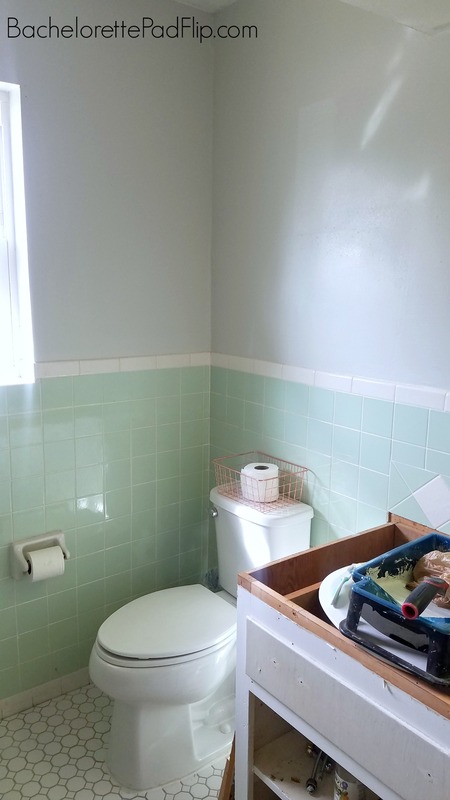 It was also painted the same minty green as the tiles. This room has seen a lot of change! 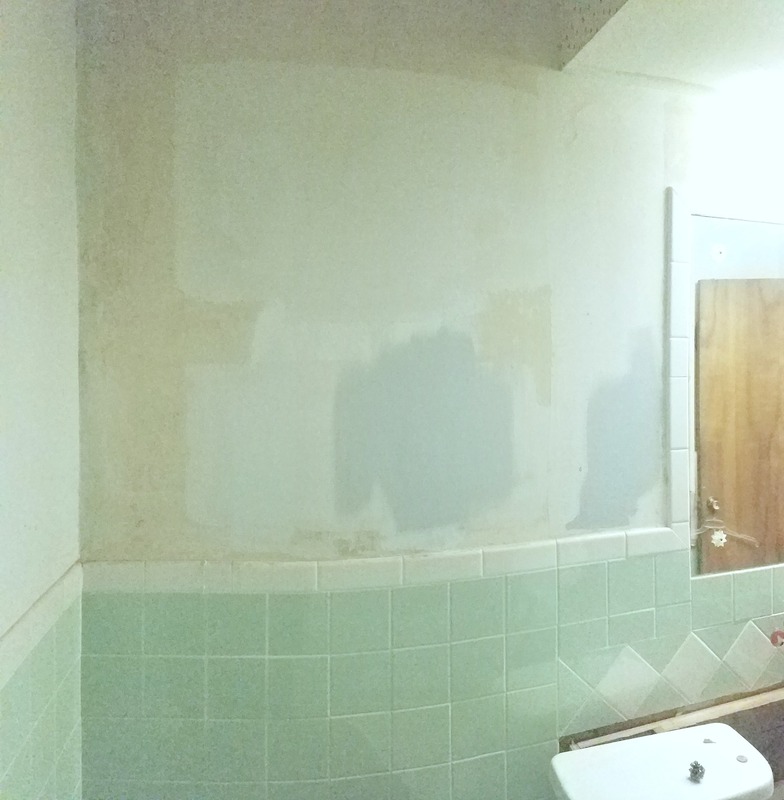 But I do love the retro wallpaper that was hiding under the existing wallpaper! After trying various shades of gray, I stopped working on it for a while. I was so annoyed, so I just lived in these conditions for a month or two. Finally, after doing some intense Pinterest homework, I took a little field trip to Benjamin Moore. And finally the sea was parted, and I found the perfect gray! 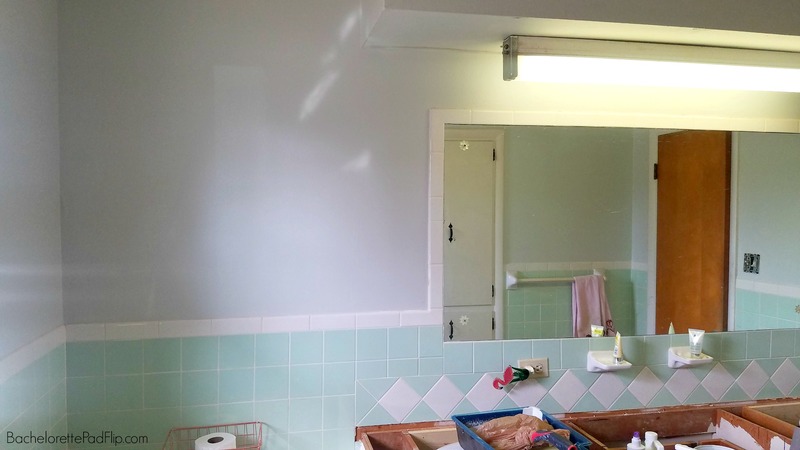 I spent the weekend prepping and painting the bathroom. Using my paint tips, I spent Friday night trimming the edges and rolling on coat 1. In case I haven’t ever mentioned it, I haaaaaate painting. Like an intense, pencils in the eyeballs kind of hate. Two minutes in, and I was cursing. 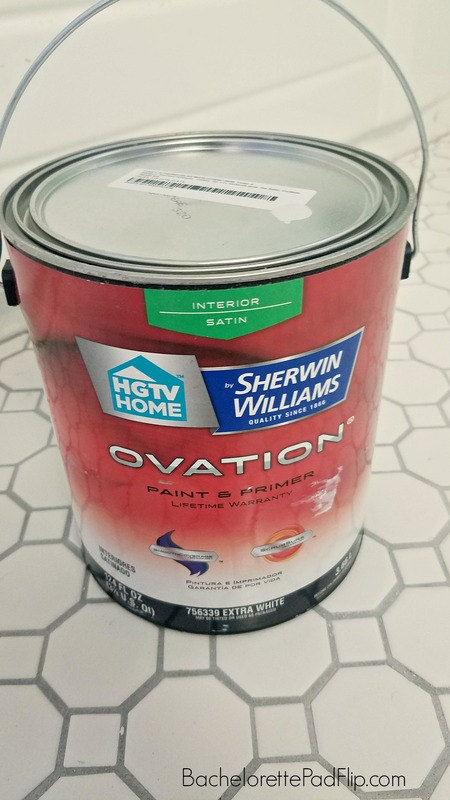 Since Benjamin Moore is too rich for my blood, I had Lowe’s color match with their Ovation paint. 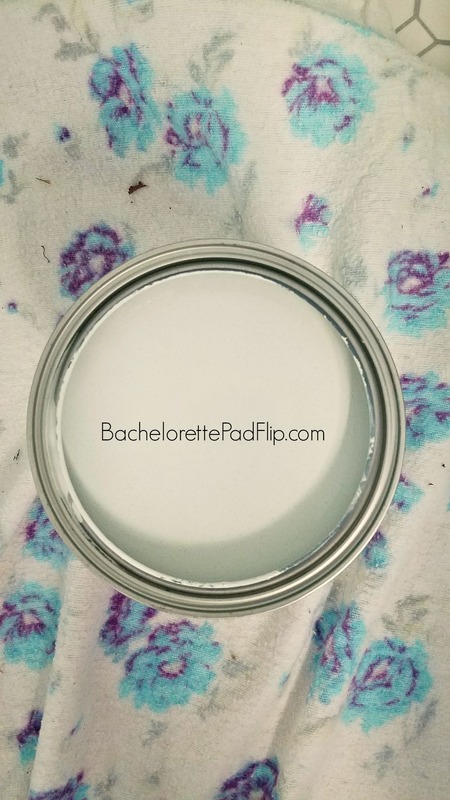 I ended up choosing Benjamin Moore’s Wickam Gray. I’d been on the hunt for a whisper gray that didn’t have a purple or brown base. Wickam Gray was perfect! Despite getting a lot accomplished in this room (like the $300 floor & Dual Sink Conversion), there is still a lot left to do in this room! Now that I’ve finished painting, I can start tackling those next projects! Photographing this room is a nightmare because of the lighting. The existing retro light fixture is not only ugly, it provides such awful light. The new window does let in a lot of natural light, but it’s still tricky getting the light right. One of my next projects is replacing that ugly light with the coolest light fixtures straight out of 1960s Miami! Even though this house is cozy, I’m lucky to have several areas of storage- like the built-in in the main bathroom. It’s one of my next projects- painting & adding new hardware. And then there’s the pink towel. Stay tuned. There’s a story in itself just about the towel. I wanted a gray that was similar, but lighter, than the grout in the tile. I was also looking for a gray that didn’t clash with the speckles in the white tile trim. 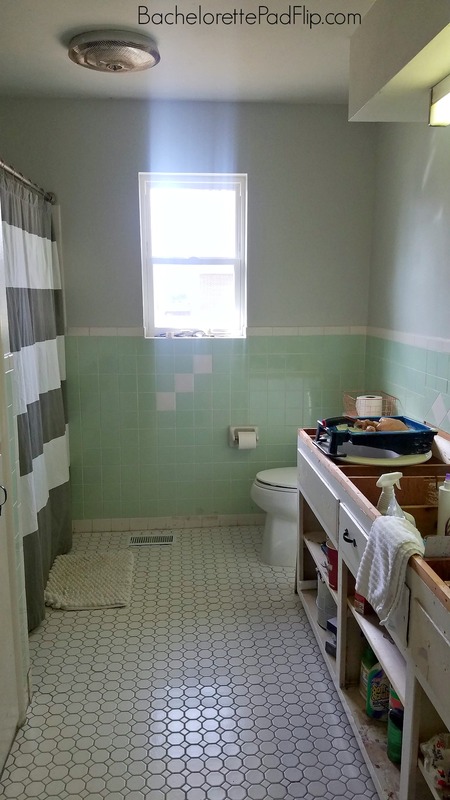 And I wanted the statement of this room to be the vintage green tile, so I was looking for a very faint gray. 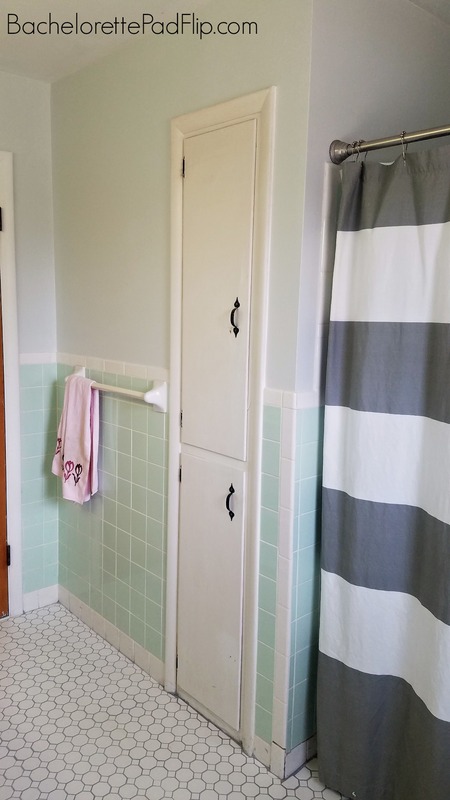 It’s similar to the gray I used in the laundry room bathroom, but, unlike that one, it’s not a purple base. I’ll probably use Wickam Gray again in future flips. The next big project is the vanity countertop. They’ve been ordered but are on back order (of course), so I’m living without a countertop for a little while longer! I ❤️ that you reminded us to only leave nice comments! Sad that you needed to write that, but I feel the same as you….keep quiet if you don’t have something nice to say. I’ve read comments left on a viral recipe that were so racist and ugly, it made me so sad and disappointed in humanity. On a recipe! A recipe! Keep up the great work!!! Thanks Amy! I wish I didn’t have to leave such a reminder. But humanity continues to prove I do! What on earth is so controversial about a recipe? !